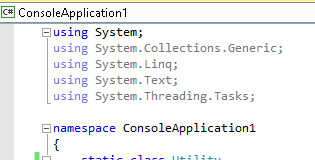 For reference, below is the list of planned C# 6.0 language features, as of 1 Apr, 2015. A primary constructor in C# 6.0 allows declaring constructor parameters as part of the type declaration and then using those parameters within auto-property initializers. You can optionally include an implementation body for the primary constructor, typically at the start of the type. The implementation includes a code block without any method name or parameters. Below, the primary constructor implementation derives the value of one property from the name parameter and does some validation on the age parameter. Below, the ShowoffNameof method reports the names of various program elements within the Dog class. This avoids having to explicitly use reflection to access the names of things. Prior to C# 6.0, if you wanted a read-only (immutable) property, you’d typically use a read-only backing field that is initialized in the constructor, as shown below. 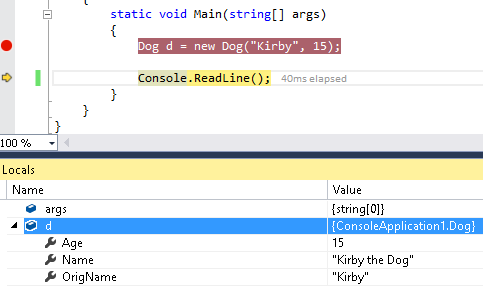 In C# 6.0, you can use auto-implemented properties to implement a read-only property. You do this by using an auto-property initializer. The result is much cleaner than the above example, where we had to explicitly declare a backing field.